Scotland's digital sector has been awarded £6.6m by the Scottish government in a bid to boost jobs and training. 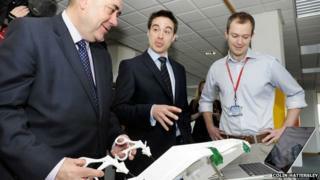 First Minister Alex Salmond said the money would help attract 11,000 jobs and give young people vital skills. As part of a wider plan, Mr Salmond also announced the development of a digital academy and 750 work placements for students. Digital firms welcomed the funding saying Scotland was "lagging behind". The digital technology sector is currently worth around £3bn to the Scottish economy and employs about 73,000 people. Speaking in Edinburgh, the first minister said there was "untapped potential" in the sector. Mr Salmond added: "Scotland is at the forefront of digital technology, with skills and expertise that is internationally recognised as among the best in the sector. "ICT and digital technologies are a key driver of economic growth. "However, despite growing demand for skills the number of young people within the sector has not kept pace. "The Scottish government believes there is even further untapped potential in our digital sector and we want Scotland to become a world-leading digital nation by 2020." The announcement came during Make Young People Your Business Week, which aims to promote digital technologies as a career for young people. John McClelland, chairman of Skills Development Scotland, said: "There is an unprecedented demand for ICT and digital technology professionals and across Europe the number of jobs is growing by more than 100,000 each year. "We need to make sure that Scotland is well placed to be able to take advantage of this growth." Phil Worms, of the cloud computing firm iomart, said the investment came "not a day too soon". He added: "It is essential that Scotland's businesses, not just those in the IT sector, have access to a highly-skilled workforce if we are to compete in today's global digital economy. "For a country which, through its inventors and creativity, has led the world in so many technological advancements, Scotland has found itself lagging behind other nations and it is essential that this trend is halted. "The launch of the [plan] is a very positive first step towards redressing this situation."